Once qipao were shapeless and the women who wore them stayed indoors. But as women became liberated, educated and self-aware, they expressed themselves in form-fitting, brightly colored qipao that sent a message: Look at me. The elegant, formfitting qipao is often considered the quintessential national dress for Chinese women, made popular in the 1920s by daring activists, fashionable socialites and celebrities. Exquisitely made and brightly colored qipao (also called cheongsam) were part of the scene in old Shanghai from the 1920s to 40s. Traditionally Chinese women's costumes were loose-fitting and women usually stayed home. But the qipao was intended to be worn in public and was an expression of individuality, femininity and women's rising status and assertiveness. An exhibition of 36 vintage qipao worn by 30 celebrities and other noted women of Shanghai is underway through July 19 at the Shanghai Mass Art Center. Archival photos are also exhibited. "The qipao demonstrates that in Shanghai, the fashion capital, Chinese women were given their first taste of freedom and individuality," says Gao Chunming, vice director of the center and an exhibition organizer. "The changes in costume over time also reflected evolving cultural and conceptual trends, as well as the rising social status of Chinese women." Derived from a long, modest, loose-fitting Mandarin garment, the qipao became all the rage among modern women. It could be conservative or daring, long or short, with high or low Mandarin dollar, sleeveless or having sleeves of any length, with low slits or famously high (up to the hip) slits on both sides of the skirt. The dress has a diagonal opening from the neck to the right armhole and is closed by fabric frog closures or buttons. Qipao could be luxurious, made of silk and elaborately embroidered with traditional Chinese patterns, like peonies and phoenix; it could be made of printed cotton or wool and became so popular it was worn by factory workers. 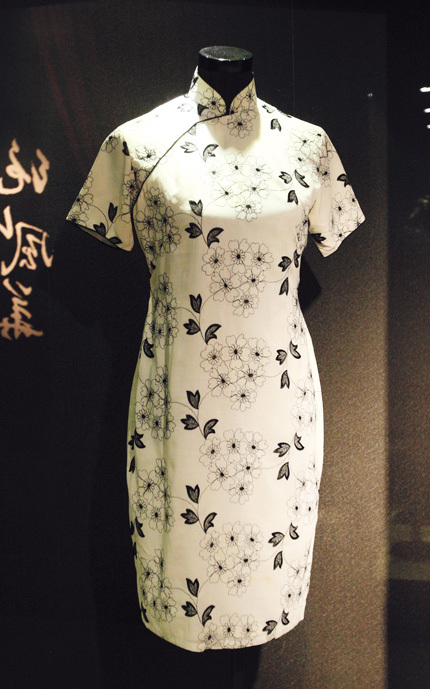 The exhibition features qipao worn by Soong May-ling (1898-2003), youngest of the Soong sisters who married Chiang Kai-shek in a lavish ceremony in Shanghai in 1927; Edith Chao (1912-2000), lover and second wife of General Zhang Xueliang, and nuclear physicist Chein-Shiung Wu (1912-1997), who is known as China's Madam Curie. Each qipao tells a story and evokes history and often glamour. Soong May-ling, sister of Soong Ching-ling, wore qipao all her life until she died at the age of 106. On many diplomatic occasions her qipao amazed the world with their beauty and elegance. Soong owned around 1,000 qipao and introduced the fashion to the West. Educator Wu Yifang (1893-1985), an activist for gender equality and social justice, enthusiastically adopted the qipao. She was one of the first women to graduate from a Chinese college. In 1945 she wore the qipao now on exhibit during the first United Nations Conference and signed the UN Charter as the first female delegate. Zhou Shiying, the great granddaughter of Zhou Fujiu, a major salt merchant from Yangzhou, wore the exhibited qipao, which was made of fine, imported wool. It was said to the first woolen qipao in Shanghai. The exhibition also features a qipao worn by Ou Li-zhen, the granddaughter-in-law of the late Qing Dynasty (1644-1911) official Li Hanzhang. She frequently wore qipao at social functions. A Shanghai tailor made this dress 10 years ago using embroidered fabric from Hangzhou. During the exhibition Xu Jingcan, niece of Juliana Koo, will also donate one of Koo's qipao to the Shanghai Center for Safeguarding Intangible Cultural Heritage. Koo, wife of famous diplomat Wellington Koo, is 106 years old and living in New York. Most of the qipao on exhibit are brightly colored, embroidered with elaborate flowers and the fabric is of excellent quality. Gao the organizer says the costumes represent "grace, serenity and femininity of Oriental beauty." The vintage qipao were made using complicated embroidery styles and techniques that are dying out since most embroidery artists are elderly. They include twisted chain stitching and double-faced embroidery. "The exhibition can help today's tailors learn sophisticated qipao design and techniques from their predecessors," Gao says. Today, at the best tailor shops in Shanghai, a good qipao usually costs several thousand yuan. It is often worn at large and formal occasions, such as weddings and receptions, as well as parties and beauty pageants. As women became liberated, educated and self-aware, they expressed themselves in form-fitting, brightly colored qipao that sent a message: Look at me.